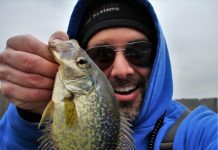 While panfish can be the easiest fish to catch, they can also be the most finicky. Though artificial baits have improved dramatically over the past few decades, it is still hard to beat the real thing. Berkley Gulp! Alive! Minnows or Berkley Gulp! Alive! Maggots are great alternatives for when live bait is not available, but FishUSA Product Specialist Matt West would like to offer his ten best tips for when live bait is an option. 1. Size is your biggest factor. Selecting the proper bait is very important, but making sure to use the correct size is essential. While a three inch minnow may produce some panfish, using a smaller minnow may produce more bites. However, if you go with too small of a profile, you may be picking through a lot of small fish. 2. Tipping your jig is almost always beneficial. The hottest thing in panfishing is jig fishing. This is a steady, consistent producer of fish and anyone can do it. 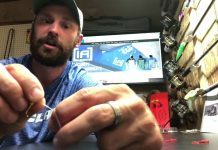 While jigs like the VMC Nymph Jigs and Custom Jigs & Spins Ratso Jigs will work alone, adding a maggot or wax worm can produce more bites. 3. Don’t be afraid to fill your hook or jig. Many anglers are afraid to use too much of their bait at once. When just fishing maggots, waxworms or mealworms, filling the hook will look more appealing to fish. 4. Double tail hook your minnow. It is hard to think of anything more enticing to slab perch and crappies than a struggling minnow. Hooking a minnow twice close to the tail will cause the minnow to struggle and stay alive longer than hooking it in the head. I typically use a small jighead such as a Wapsi Fly Tying Jig Head for this tactic. The weight of the jig will cause the minnow to struggle more and the color of the jighead is attractive to the fish. A small hook and a few split shots will also do the trick. 5. Small red worms are still highly effective. This simple live bait is widely overlooked by the avid or advanced angler. 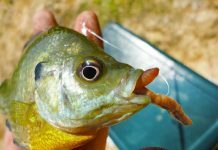 Using small red worms for bluegills or perch can be very effective, out-producing other baits at times. 6. Using perch eyes for perch. This technique has been used for decades. When perch fishing slows down, using a perch eye can be a deadly method. 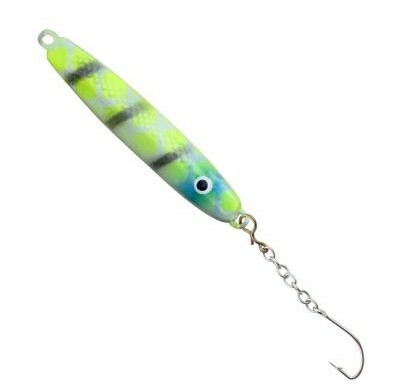 Combining a perch eye with a Hali Sukkula Jig is tantalizing to any perch looking for a meal. 7. Grasshoppers and crickets for topwater panfish. This technique may not be the most productive when it comes to panfishing, but it can be the most thrilling. Watching a bluegill come up and take a struggling grasshopper off a calm lake surface is extremely exciting and a great way to fish with kids. 8. Make sure you select the right baitfish. This is a very common error anglers make when selecting their baitfish. Making sure you are using a baitfish that is common in your lake is crucial to producing fish. While this may not make a difference on a good day it will be helpful when the fish have turned off or are under pressure. 9. Use attractants. There are many variations of attractants for fishing. Adding a drop of Berkley PowerBait Attractant can help produce more bites. The new “hot-ticket item” for attracting fish is using BaitCloud to attract fish. 10. Keep your bait fresh. The most important rule of using live bait is keeping it fresh. Fish typically prefer live bait or freshly dead. When you are done using larvae like maggots or waxworms, make sure to refrigerate them. Remember to aerate minnows if you plan to use them the next day, too.